Naftalan is a rare type of oil from Azerbaijan that is used only for medicinal purposes. Azerbaijani doctors have prescribed it for years to successfully treat various skin, joint and bone diseases such as psoriasis, arthritis and rheumatism. The town of Naftalan, where the oil originates, has a special treatment center that was well known throughout the entire Soviet Union. Most of the center is now being used as a dormitory to house refugees from the Karabakh War. Here Eldar Abbasov, Director of Azerbaijan's Scientific Arthritis Center, explains how physicians in Azerbaijan use Naftalan and how the rest of the world could benefit from its therapeutic qualities. Naftalan is extracted from only one place in Azerbaijan - in the north - central part of the country, not far from Ganja. The town in question takes its name from the oil, "Naftalan", which comes from the Azeri for "neft alan" (oil buyer). 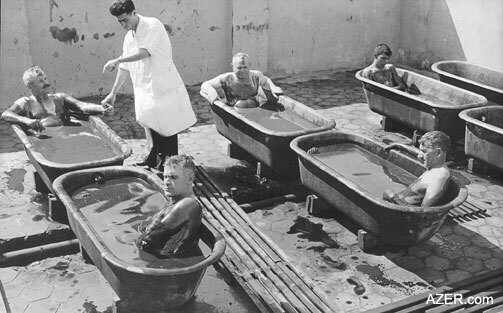 Above: Men bathing in Naftalan, a rare type of healing oil found only in Azerbaijan (1958). Naftalan is used in Azerbaijan to treat arthritis, skin diseases and various other conditions. In its raw form, Naftalan oil is used for therapeutic baths, known as balneotreatment. The 1,000-bed Therapeutic Center in Naftalan has special treatment tubs for this type of therapy. Left: Since the Karabakh War, the majority of rooms at the Naftalan Treatment Center have been occupied by refugees. Products made from the purified Naftalan can be found at many drugstores in Azerbaijan. In addition, the Naftalan is delivered to all of the physiotherapy treatment sections of health and treatment centers in Baku and the rest of Azerbaijan, including our center, the Scientific Arthritis Center of Azerbaijan. Medicine made from purified Naftalan is used for various kinds of external and internal treatment. The type of application depends on the specific disease and the doctor's recommendations. For diseases like eczema and psoriasis, for instance, the Naftalan-based medicine is rubbed on the skin. In the case of joint diseases, Naftalan is rubbed on the skin before applying ultrasound; that way, the oil can help the ultrasound penetrate more effectively. To reduce internal inflammation, as with vaginitis or intestinal inflammation, Naftalan is used in the form of tampons or suppositories. 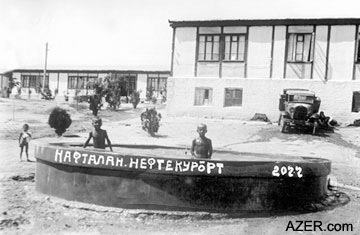 Right: The Naftalan Treatment Center in north-central Azerbaijan (1936). Patients traveled there from all over the Soviet Union seeking medical treatment with Naftalan. As a powerful anti-pain and anti-inflammatory agent, Naftalan is widely used to treat back pain and arthritis. The oil reduces edema and pain and improves joint functions. In osteoarthritis or injuries of the spinal column, Naftalan eliminates neurological pain. Naftalan is not a panacea, however. It can be helpful for one patient, but adverse for another. For burn patients, Naftalan is not used in the initial, acute period, but it is used later on to help speed up the regeneration process and prevent the formation of scars. Even though Naftalan is not carcinogenic, it is not applied to patients who have tumors. As with other thermal procedures, Naftalan could speed the development of a tumor. Likewise, Naftalan is not used when an inflammation is in its acute stage because the oil may actually speed up the inflammation process. If the inflammation is of a systemic character, such as when it has covered the lungs or liver, Naftalan should not be used. Beginning in the Soviet period, Azerbaijani scientists began studying the components of Naftalan oil to find out how its chemical processes work. 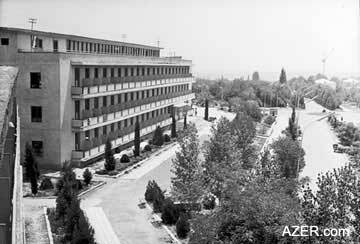 Scientific research laboratories for the study of Naftalan were set up during the Soviet period, with branches in Baku and Naftalan. The scientists there studied the naphthene hydrocarbons to find out what makes them so effective. They identified the diseases that Naftalan can treat as well as possible side effects and complications. However, even more research is required to study how the mechanism found in Naftalan works at the cellular level. If you ask any three people in the world if they have problems with their backs, two of them will probably say "yes". In fact, the World Health Organization (WHO) has declared the years of 2000-2010 as the decade for the struggle against bone, joint and muscular diseases. These widespread diseases may not be perceived as being as serious as heart disease or cancer because they don't result in death. However, they have grave social and economic implications. Patients who suffer from these debilitating diseases require drugs throughout their entire lives. If they don't receive regular treatment, they could become disabled. But the world's poor can hardly afford to have access to such expensive drug therapy. Treatments like Naftalan could be extremely valuable for the world's medical needs. For example, we know that chronic arthritis is widespread throughout the world. Patients who suffer from this disease must have ongoing drug treatment. Yet in Azerbaijan, the arthritis patients who undergo a 10-day regimen of Naftalan treatment often find that their pain is alleviated for an entire year, meaning that they don't have to take additional medicine. Naftalan is a precious resource that Azerbaijan can offer to the world, but its potential has yet to be seriously understood or marketed. Azerbaijani experts should bring this matter to the world's attention at congresses, seminars and other international venues. Once others hear of the effectiveness of the Naftalan treatment, international interest will surely grow. Professor Eldar Abbasov is Director of the Arthritis Center in Baku. For more about Naftalan, see "The Oil that Heals" in AI 3.4 (Winter 1995). SEARCH at AZER.com.